I tend to make pickles or athanu as Gujaratis call it with caution. I stick to the normal ones that turn out well like chundo and lemon pickle. A while ago a lady came down to Kenya from US for a holiday. 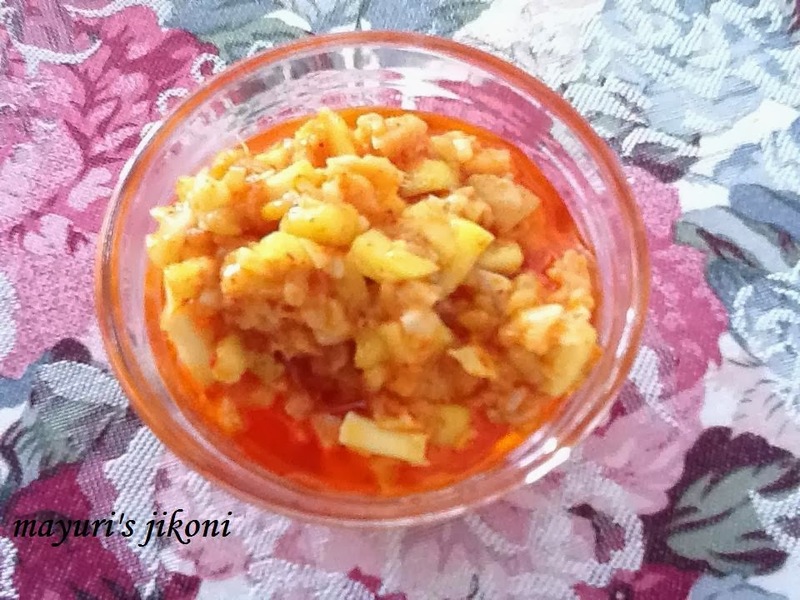 She tasted mango pickle with garlic and fenugreek seeds and loved it. She returned home and began her search on the website for the recipe of this particular pickle that she had tasted. She didn’t find it and her search brought her to my blog. She wrote to me asking if I knew how to make the pickle. My first reaction was…oh no not a request for a pickle recipe! Remember, I am very caution about making pickles. I do tend to take those old housewives tales seriously when it comes to pickles. Particular types of hands make the pickle go mouldy, pickles should not be made when you are menstruating, etc etc. Most other beliefs I tend to brush off but some stick to the brains and refuse to leave. Anyway, coming back to the mango pickle, from what little description the lady gave me, I presumed it is similar to the one my mum use to make and I didn’t pay much attention to! So began my research not on the website but talking to the older generation of women. I got one version where the soaked fenugreek seeds were stuffed into tiny little mangoes and put in brine and others mentioned the normal mango pickle with pickle masala and ground fenugreek seeds. My kaki (chachi) couldn’t help me with the exact measurement but gave me the method for the one she and my mum use to make. So with a bit of trail and error came up with this measurement for a quick, delicious and easy to make methi keri nu athanu. I am hoping that the Tourist Lady had this pickle in mind when she wrote to me. Soak the fenugreek seeds in lukewarm water overnight. Next day drain out the water and dry the seeds on a paper towel. In the meantime peel and finely chop raw mango/mangoes. Stir fry the ginger and garlic paste for 30 seconds or so. It should not be overcooked. Add the fenugreek seeds and stir fry for 15 seconds or till you feel that the seeds. Add the chopped mango and mix well. Take the pan off the heat. Remember, you don’t have to cook the mango. Add salt, pickle masala, red chilli powder and mix well. The pickle is ready to be served with anything from parathas to rice. Use any ready made pickle masala of your choice. Adjust the amount of spices and salt according to your taste. Use a mango that does not have too many fibres. I used the small green ones that are commonly found in India and Kenya. I had presumed that the fenugreek will make the pickle taste bitter but on the contrary it adds a nice flavour to it. Store the pickle in a jar in the fridge. It may get spoiled as the mango is not cooked and the fenugreek may make it stringy.